On arrival at Lusaka International Airport, you will be met and assisted and then board a connecting Mfuwe flight. Our guide will meet you at Mfuwe Airport for transfer to Luangwa River Camp, through colourful village life. The ten bedded camp is situated opposite the Luangwa Wafwa (a game rich area of the park) in the Upper Lupande Game Management Area. It offers all the creature comforts of a lodge yet with all the intimacy, tailored activities and flexible mealtimes you come to expect from a bush camp. The camp is unique with its décor of locally crafted and handmade details. The main area is elevated between 1-3 metres on wooden decks affording great views to the park and river. The swimming pool is sunk into the deck, linked by a waterfall. Seating areas are all elevated and open plan with a bar area as well as a dining and reading area. Depending on your arrival time you may settle in for some lunch, siesta then off on an afternoon activity. There is an option to turn back after sundowners or continue to see what nocturnals you can spot, returning to camp by 8pm. The next couple of days will be spend as you wish – an option is there to take a walking activity or game drive; or even both. For those with a knack for shopping can take a trip to Tribal Textiles for locally printed fabrics which are sewn into various items – perfect for souvenirs or gifts for friends and family. Perhaps a trip to Kawaza Village to experience an authentic Zambian village, interact with the locals and even sample a local meal. Nothing is set in stone; you can discuss your specific interests with your guide. After an early breakfast, transfer to Mfuwe Airport for the flight to the Lower Zambezi (1 hour 30 mins). 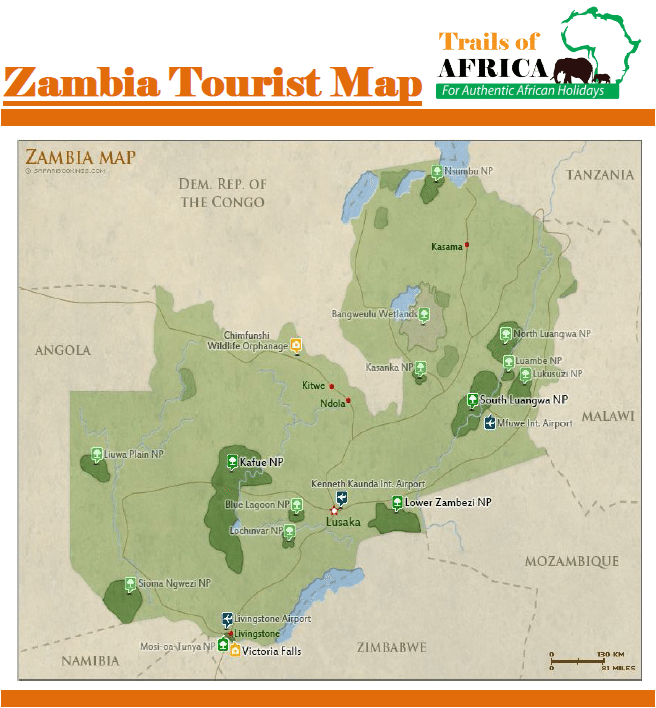 As you fly into the area, you will see the wide Zambezi River, dotted with islands. Buffalo and elephant are always seen feeding along with the pods of hippos that rest on the edge of the sandbanks. There are a variety of activities to choose from. Not only on offer are exciting day and night drives and bush walks, but guests can choose their own day’s itinerary from a selection of canoe trips, river safaris plus catch & release angling for the infamous tiger fish. After breakfast and farewells you will be taken to Royal airstrip to meet the plane taking you to Lusaka for your onward connection.